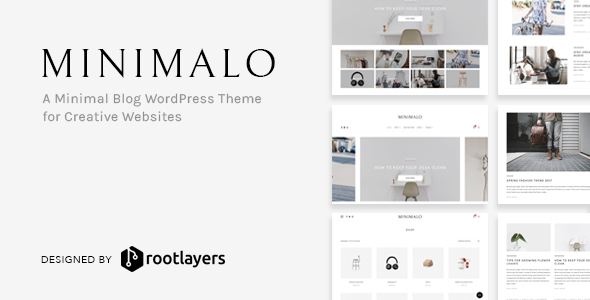 Minimalo â€“ is a minimal blog WordPress theme for creative websites. With four different post layouts, support for WordPress post formats, and support WooCommerce plugin, you can get your blog and shop running in minutes. You can use Minimalo to build any kind of blog and shop like magazine, fashion, travel, food, handmade product, clothing, furniture, jewelry, accessories or any other. **All images, video, and audio used on the preview site of this theme are not included in the download package.